St. John’s Preschool offers a summer program from June to July, approximately seven weeks in duration. The specific schedule and information, including fees are available in early spring. Early and extended care is available, which include different hours than the normal school year. Fall down the rabbit hole with us as we enter a wonderland of fun and learning. In this camp we will explore the whimsical story of Alice in Wonderland and share in some of Alice’s adventures. Children will practice manners during an “un-birthday” tea party, use large motor skills as they play flamingo croquet, and get artistic as they paint the Queen of Hearts’ roses. On Friday, we plan on attending a showing of Sesame Street’s Abby in Wonderland in St. John’s theater room, the “Son”set Cinema. This camp combines literacy and cooking skills in one! 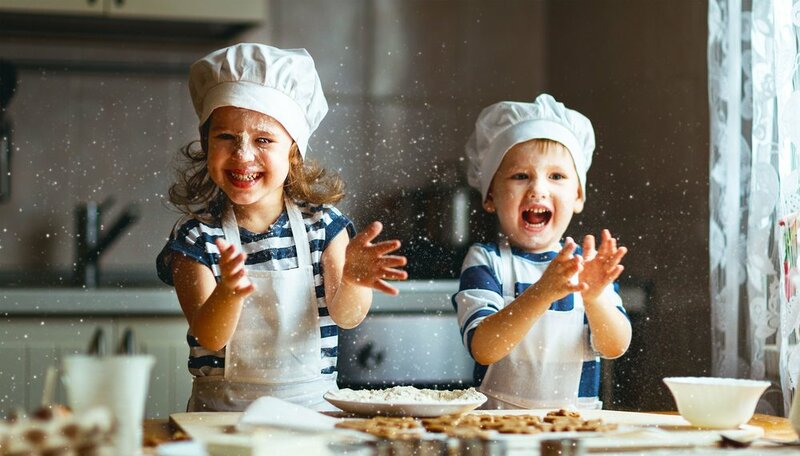 Each day students will read a classic book, such as The Little Red Hen or Goldilocks and the Three Bears, and then participate in a cooking activity based on that story. By the end of this camp children will have made a recipe book and have learned some basic cooking techniques along with important safety rules for the kitchen. Preschool will be closed the week of June 17 – 21 . VBS will be offered through the church. It makes “sense” to join us for some scientific fun with our senses! From guess-that-smell games to experiments with textures, children will learn all about the five ways we can explore God’s world around us. Every day we will investigate a different sense through engaging and creative projects and activities. We will end the week with a fun activity that uses all our senses at once: making edible chocolate play dough! This camp is all about celebrating our wonderful country. Our patriotic fun will include art activities and yummy snacks as well as learning about the diversity of the United States by exploring Native American and Hawaiian cultures. On Friday, we will celebrate with an all-American ice cream party. Please note the preschool will be closed Thursday of this week in observance of the Fourth of July. Our annual art camp is always full of messy and instructive fun! This week children will have the opportunity to explore art through a variety of materials and artistic techniques. Through painting, drawing, and sculpting, students will express their creativity as they form their own masterpieces. On Friday, we will have an art show to display their unique creations. Oh, the thinks kids can think in this summer camp! This week children will explore the fantastical worlds created by the beloved Theodore Seuss Geisel, not only by reading his books, but also through fun activities and snacks. We plan to end the week with a Dr. Seuss-themed story time with the children’s librarian from Erna Fergusson library. Each Camp is $130.00 a week.